When calling a business, or any person who might receive a high volume of calls, one can expect to need to wait for an operator to become available. Sometimes, if there are few operators available, too many incoming calls, or both, a character can be left waiting for quite a while. These wait times may feel like hours in real life, but fictional wait times can take days to really drive the point home. During this time, a recording will almost always remind the caller that "Your call is important to us" and ask them to continue holding. Sometimes, a character may be placed on hold by the person they have called. Usually they will leave the phone or forget about it entirely. Sub trope of For Inconvenience, Press "1". One commercial has a lady call an office after getting out of bed in the morning. A recording repeatedly asks her to continue to hold as she goes about her day. Just before she goes to bed that evening, the recording says that their offices are now closed and to call back tomorrow. Peggy of the Discover Card advertisements was a master of this . Customer: I've been waiting for fifteen minutes for someone to pick up. Peggy: You're tenacious like bull. I like. Please hold. Customer: No, no, no! Peg—! Peggy: (staring at a bank of ringing phones) So pretty. Played for Drama in one commercial where a woman calls a security company to inquire about getting a security system after her house is broken into. When someone picks up, the woman informs her she has the wrong department and puts her back on hold. A T-Mobile commercial from 2018 features a man on hold with his current cell provider's customer service. He attempts to press "0" to no success because the automated answering service does not consider it a valid option. He is shown running about his day including dancing to the hold music. When the call is finally answered by a man named Daniel, he immediately puts the man on hold again. "Suicide Hotline! Please hold!" Truth in Television, unfortunately. In Dave Barry In Cyberspace, Dave makes a joke about having once been stuck on hold on a computer company's tech support line for the lifespan of a caribou. Mr. Moseby calls tech support in an episode of The Suite Life on Deck. He's put on hold overnight and wears a headset so that he can perform his duties on the ship while holding. The call is eventually answered by Zack and Cody, who are visiting a call center while the ship is in port. Friends. In "The One with the Screamer", Phoebe spends several days on hold (on Monica's phone) with a company she needs to talk to before her phone warranty expires. It is only after these days have passed that they realize they are being charged for this call (Long distance) since Phoebe had mistaken the Utah area-code for a toll-free number. Seinfeld. Kramer rages war with the cable company, after they made him wait all day for an appointment years before. When the cable guy phone's Kramer to access his apartment, Kramer excuses himself and puts him on hold — complete with a tape recorder playing elevator music. Fade to the cable guy at the payphone, checking his watch, when Kramer finally rides by in a taxi to taunt. In I Love Lucy, Lucy calls Ricky and has him stay on hold while she goes from downtown to their apartment so that Mrs. Hansen can't call and ask him about the check she gave her on the dress shop he doesn't know she and Ethel bought. In one episode of The West Wing, Josh is put on hold when trying to find out when the power to the polling phone bank will come back on. "I'm on hold. I'm on hold. I'm in some kind of hellish hold world of holding." Downplayed in an episode of The Office (US) where Dwight and Jim team up to make a sale. At the beginning the meeting, Dwight uses the client's phone to make a call while Jim speaks to the client directly. After working through an extension directory Dwight places the phone on the desk as it plays hold music. Once Jim finishes the pitch, he reveals that Dwight's phone call was to one of the big name companies that competes with Dunder-Mifflin and they have been on hold for the entire time. They then call up Kelly (their customer service) to show that Dunder-Mifflin has superior service when she answers the call immediately. The sideplot of one episode of Married... with Children concerns Al on the phone with an auto parts store, in one case being one one phone call for days as the answering machine lists the various For Inconvenience, Press "1" options. In one episode of Fresh Meat, Howard is on hold for 48 hours. When they finally pick up, Howard is busy hooking up with Sabine. In the final episode of Drop the Dead Donkey, Gus Hedges is trying to get Sir Royston on the phone. Sycophant that he is, he placidly stays on hold even when Sir Royston sends someone to torch Globelink News for the insurance money. Red Dwarf: In the season 10 episode "Trojan", a runner during the episode is Lister trying to order a drink-stirring machine from the automated phone system "All-Droid", spending most of the episode with a phone in hand, still on hold. This ends up intersecting with the main plot when a simulant orders them, at gunpoint, to not move, just as an operator finally gets on the line, on the phone which is now halfway across the room. Naturally, Lister would rather risk death than wait on hold that long again and makes a lunge for the phone, setting off a firefight. Operator: Your call is important to us. Please stay on the line until your call is no longer important to you. Get Fuzzy. Invoked in a 2005 story arc, in which Rob attempts to get in touch with Dull Computer customer support. At one point during his call, he's placed on hold for hours — so many hours, in fact, that he can't make dinner, and has Satchel order pizza for the night. Meanwhile, at Dull Computers, a few customer service reps boast about their personal records of keeping customers on hold , ranging from three hours to five hours, to one guy who still has a customer on hold as they speak. Sherman's Lagoon has a storyline where Sherman is on hold for days. 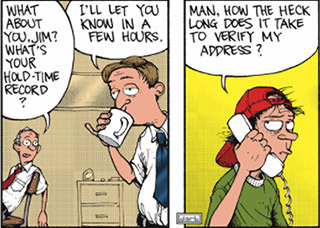 Zits has a story where Jeremy calls a company and is told "please hold while we jack you around from department to department." He declares that it's nice to see some corporate honesty. In another, he tells a caller to wait while he gets a pencil... then goes all the way to the office supply store to buy one, leaving the caller waiting for what's assumed to be hours. There are various spoof "On hold" messages on YouTube designed to be played to telemarketers when they call. Most of them provide an estimated wait time that's in days or months. This one tells the telemarketer their call may have been forgotten, and to continue holding until someone remembers they're still on hold. The Powerpuff Girls. In "Telephonies," the Gangreen Gang makes prank calls to various different Townsville citizens. Lil' Arturo pranks Professor Utonium, by telling him that he just won a ten-million-dollar sweepstakes and asking him to remain on hold, which the Professor does for the rest of the episode, despite Arturo hanging up. On American Dad!, Roger and Steve call a company to complain about a shoddy novelty product they bought. They are left on hold for what is implied to be days, only to be transferred to voice mail. In The Simpsons episode where the family goes to Australia, Bart calls a boy in Australia to ask which direction the water in the sink is flowing. The boy has to check with his neighbour who lives many miles away, so he places Bart on hold and spends half the day visiting his neighbor and going back to answer the question. By the time he gets back Bart had already gone to bed and no longer cared about the question at all. In one episode of Life with Louie, Ora (the mother of the main character) calls the camp where Louie is on a vacation, since she wants to talk to him. Due to the fact that Louie is currently on a trip through the forest, and a troubled one at that, the woman who receives the call tells Ora that it might take some time before he can come to the phone. Ora says that she will wait anyway, possibly spending a few hours just sitting at the phone silently. The episode ends with Louie's dad receiving an absurdly high phone bill. In the Arthur episode "He Said, He Said", the cable goes out at the Read house, and Jane calls the company. She's put on hold, and a few scenes later, we cut back to Jane, still in the kitchen on the phone, with a bored, exasperated expression on her face. We never find out if she actually gets through to a person, or indeed, whether a conversation with a representative is necessary to ensure restoration of the cable signal. A Running Gag in the first season of Bojack Horseman is BoJack's inability to hold a phone call with his agent Princess Carolyn for more than a few minutes before she puts him on hold, sometimes for hours. And just to make it even more frustrating, the wait music is an endless loop of "Jellicle Songs For Jellicle Cats." A common tactic when people are cold called is to say "just wait a minute" and then leave the phone indefinitely, with the caller holding until they realize no one is coming back. One guy who called Comcast to cancel his service was placed on hold for 3 hours . During this time their call centers closed and they left him on hold.